"Crawfish" redirects here. For other uses, see Crawfish (disambiguation). This article is about the living animal. For crayfish as food, see Crayfish as food. For other uses, see Crawfish (disambiguation). Crayfish, also known as crawfish, crawdads, crawlfish, crawldads, freshwater lobsters, mountain lobsters, mudbugs, or yabbies are freshwater crustaceans resembling small lobsters (to which they are related). Taxonomically, they are members of the superfamilies Astacoidea and Parastacoidea. They breathe through feather-like gills. Some species are found in brooks and streams where there is running fresh water, while others thrive in swamps, ditches, and paddy fields. Most crayfish cannot tolerate polluted water, although some species such as Procambarus clarkii are hardier. 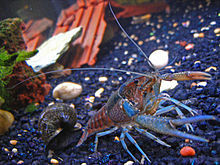 Crayfish feed on animals and plants, either living or decomposing, and detritus. Rearing white clawed cray at Cynrig hatchery, Wales. Establishing a breeding population from introduced captive-bred animals. The name "crayfish" comes from the Old French word escrevisse (Modern French écrevisse). The word has been modified to "crayfish" by association with "fish" (folk etymology). The largely American variant "crawfish" is similarly derived. Some kinds of crayfish are known locally as lobsters, crawdads, mudbugs, and yabbies. In the Eastern United States, "crayfish" is more common in the north, while "crawdad" is heard more in central and southwestern regions, and "crawfish" further south, although there are considerable overlaps. The study of crayfish is called astacology. In Australia (on the eastern seaboard), New Zealand and South Africa, the term crayfish or cray generally refers to a saltwater spiny lobster, of the genus Jasus that is indigenous to much of southern Oceania, while the freshwater species are usually called yabby or kōura, from the indigenous Australian and Māori names for the animal respectively, or by other names specific to each species. Exceptions include western rock lobster (of the Palinuridae family) found on the west coast of Australia; the Tasmanian giant freshwater crayfish (from the Parastacidae family) found only in Tasmania; and the Murray crayfish found along Australia's Murray River. In Singapore, the term crayfish typically refers to Thenus orientalis, a seawater crustacean from the slipper lobster family. True crayfish are not native to Singapore, but are commonly found as pets, or as an invasive species (Cherax quadricarinatus) in the many water catchment areas, and are alternatively known as freshwater lobsters. The body of a decapod crustacean, such as a crab, lobster, or prawn (shrimp), is made up of twenty body segments grouped into two main body parts, the cephalothorax and the abdomen. Each segment may possess one pair of appendages, although in various groups these may be reduced or missing. On average, crayfish grow to 17.5 centimetres (6.9 in) in length, but some grow larger. Walking legs have a small claw at the end. There are three families of crayfish, two in the Northern Hemisphere and one in the Southern Hemisphere. The Southern Hemisphere (Gondwana-distributed) family Parastacidae, with 14 extant genera and two extinct genera, live(d) in South America, Madagascar and Australasia. They are distinguished by the absence of the first pair of pleopods. Of the other two families, the three genera of the Astacidae live in western Eurasia and western North America, while the 15 genera of the family Cambaridae live in eastern Asia and eastern North America. The greatest diversity of crayfish species is found in southeastern North America, with over 330 species in nine genera, all in the family Cambaridae. A further genus of astacid crayfish is found in the Pacific Northwest and the headwaters of some rivers east of the Continental Divide. Many crayfish are also found in lowland areas where the water is abundant in calcium, and oxygen rises from underground springs. In 1983, Louisiana designated the crayfish, or crawfish as they are commonly referred, as their official state crustacean. Louisiana produces 100 million pounds of crawfish per year with the red swamp and white river crawfish being the main species harvested. Crawfish are a part of Cajun culture dating back hundreds of years. A variety of cottage industries have developed as a result of commercialized crawfish iconology. 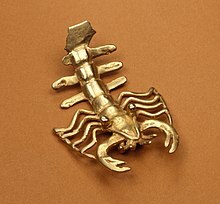 Their products include crawfish attached to wooden plaques, T-shirts with crawfish logos, and crawfish pendants, earrings and necklaces made of gold or silver. Australia has over 100 species in a dozen genera. Australia is home to the world's three largest freshwater crayfish – the Tasmanian giant freshwater crayfish Astacopsis gouldi, which can achieve a mass of over 5 kilograms (11 lb) and is found in rivers of northern Tasmania,, the Murray crayfish Euastacus armatus, which can reach 2.5 kilograms (5.5 lb), although there have been reports of animals up to 3 kilograms (6.6 lb) and is found in much of the southern Murray-Darling basin. and marron from Western Australia (now believed to be two species, Cherax tenuimanus and C. cainii) which may reach a weight of 2.2 kilograms (4.9 lb). Many of the better-known Australian crayfish are of the genus Cherax, and include the , common yabby (Cherax destructor), western yabby (Cherax preissii) and red-claw crayfish (Cherax quadricarinatus). The marron species C. tenuimanus is critically endangered, while other large Australasian crayfish are threatened or endangered. In New Zealand, two species of Paranephrops are endemic, and are known by the Māori name kōura. Fossil records of crayfish older than 30 million years are rare, but fossilised burrows have been found from strata as old as the late Palaeozoic or early Mesozoic. The oldest records of the Parastacidae are in Australia, and are 115 million years old. 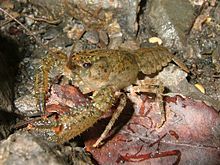 Some crayfish suffer from a disease called crayfish plague, caused by the North American water mould Aphanomyces astaci which was transmitted to Europe when North American species of crayfish were introduced there. Species of the genus Astacus are particularly susceptible to infection, allowing the plague-coevolved signal crayfish to invade parts of Europe. Crayfish are eaten worldwide. Like other edible crustaceans, only a small portion of the body of a crayfish is eaten. In most prepared dishes, such as soups, bisques and étouffées, only the tail portion is served. At crawfish boils or other meals where the entire body of the crayfish is presented, other portions, such as the claw meat, may be eaten. Like all crustaceans, crayfish are not kosher because they are aquatic animals that do not have both fins and scales. They are therefore not eaten by observant Jews. As of 2005, Louisiana supplies 95% of the crayfish harvested in the US. In 1987, Louisiana produced 90% of the crayfish harvested in the world, 70% of which were consumed locally. In 2007, the Louisiana crawfish harvest was about 54,800 tons, almost all of it from aquaculture. About 70%–80% of crayfish produced in Louisiana are Procambarus clarkii (red swamp crawfish), with the remaining 20%–30% being Procambarus zonangulus (white river crawfish). Crayfish are preyed upon by a variety of ray-finned fishes, and are commonly used as bait, either live or with only the tail meat. They are a popular bait for catching catfish, largemouth bass, smallmouth bass, striped bass, perch, pike and muskie. When using live crayfish as bait, anglers prefer to hook them between the eyes, piercing through their hard, pointed beak which causes them no harm; therefore, they remain more active. When using crayfish as bait, it is important to fish in the same environment where they were caught. An Illinois State University report that focused on studies conducted on the Fox River and Des Plaines River watershed stated that rusty crayfish, initially caught as bait in a different environment, were dumped into the water and "outcompeted the native clearwater crayfish." Other studies confirmed that transporting crayfish to different environments have led to various ecological problems, including the elimination of native species. Transporting crayfishes as live bait has also contributed to the spread of zebra mussels in various waterways throughout Europe and North America, as they are known to attach themselves to exoskeleton of crayfishes. 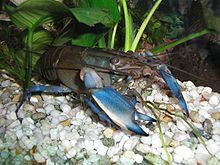 Crayfish are kept as pets in freshwater aquariums, typically with bluegill or bass, rather than goldfish or tropical or subtropical fish. They prefer foods like shrimp pellets or various vegetables, but will also eat tropical fish food, regular fish food, algae wafers, and small fish that can be captured with their claws. A report by the National Park Service as well as video and anecdotal reports by aquarium owners indicate that crayfish will eat their molted exoskeleton "to recover the calcium and phosphates contained in it." As omnivores, crayfish will eat almost anything; therefore, they may explore the edibility of aquarium plants in a fish tank. However, most species of dwarf crayfish, such as Cambarellus patzcuarensis, will not destructively dig or eat live aquarium plants. They are also relatively non-aggressive and can be kept safely with dwarf shrimp. In some nations, such as the United Kingdom, United States, Australia, and New Zealand, imported alien crayfish are a danger to local rivers. The three species commonly imported to Europe from the Americas are Orconectes limosus, Pacifastacus leniusculus and Procambarus clarkii. Crayfish may spread into different bodies of water because specimens captured for pets in one river are often released into a different catchment. There is a potential for ecological damage when crayfish are introduced into non-native bodies of water: e.g., crayfish plague in Europe, or the introduction of the common yabby (Cherax destructor) into drainages east of the Great Dividing Range in Australia. ^ "crawlfish". Dictionary of American Regional English. Retrieved 30 October 2018. ^ "crawldad". Dictionary of American Regional English. Retrieved 30 October 2018. ^ Christoph Needon; Johannes Petermann; Peter Scheffel; Bernd Scheibe (1971). Plants and Animals (Pflanzen und Tiere). Leipzig: Urania Verlag. ^ Wedgwood, Hensleigh (1855). "On False Etymologies". Transactions of the Philological Society (6): 65. ^ C. W. Hart Jr. (1994). "A dictionary of non-scientific names of freshwater crayfishes (Astacoidea and Parastacoidea), including other words and phrases incorporating crayfish names". Smithsonian Contributions to Anthropology. 38 (38): 1–127. doi:10.5479/si.00810223.38.1. hdl:10088/1372. ^ a b Pableaux Johnson. "Mudbug Madness : Crawfish". Bayou Dog. Archived from the original on 19 August 2006. Retrieved 28 August 2006. ^ Bert Vaux; Scott A. Golder. "Dialect survey". Harvard University. Retrieved 30 September 2006. ^ "About the International Association of Astacology". Archived from the original on 5 April 2005. ^ Harold W. Sims Jr. (1965). "Let's call the spiny lobster "spiny lobster"". Crustaceana. 8 (1): 109–110. doi:10.1163/156854065X00613. JSTOR 20102626. ^ "Sweet Chilli Crayfish (龙马精神)". mywoklife.com. 13 February 2010. ^ "FAR OCEAN SEA PRODUCTS (PRIVATE) LIMITED". dollarvietnam.com. ^ Classic Asian Noodles. Marshall Cavendish. 2007. ISBN 978-9812613356. ^ Shane T. Ahyong; Darren C. J. Yeo (2007). "Feral populations of the Australian Red-Claw crayfish (Cherax quadricarinatus von Martens) in water supply catchments of Singapore". Biol Invasions. 9 (8): 943–946. doi:10.1007/s10530-007-9094-0. ^ "Crayfish (aka Freshwater Lobster) – Arofanatics Fish Talk Forums". 9 December 2004. ^ Horton H. Hobbs Jr. (1974). "Synopsis of the families and genera of crayfishes (Crustacea: Decapoda)" (PDF). Smithsonian Contributions to Zoology. 164 (164): 1–32. doi:10.5479/si.00810282.164. ^ Steve Pollock (2005). Eyewitness Ecology. New York, United States: Dorling Kindersley. ISBN 978-0-7894-5581-9. 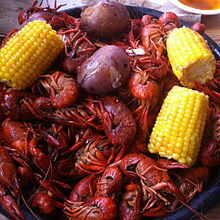 ^ "The Crawfish – Louisiana's State Crustacean". American Profile. 11 August 2002. Retrieved 25 November 2017. ^ "Crawfish Louisiana State Crustacean". State of Louisiana-Department of Administration. Retrieved 25 November 2017. ^ "Crawfish Deeply Rooted in Louisiana Culture". Voice of America. 19 April 2016. Retrieved 25 November 2017. ^ Gutierrez, C. Paige (1 January 2012). Cajun Foodways. University Press of Mississippi. p. 78. ISBN 9781604736021. Retrieved 25 November 2017. ^ "Tasmanian Giant Freshwater Lobster (Astacopsis gouldi)". Department of the Environment, Water, Heritage and the Arts. 9 February 2007. Retrieved 16 March 2010. ^ Fisheries Scientific Committee (2013). "The Murray crayfish – Euastacus armatus as a Vulnerable Species" (PDF). NSW Department of Primary Industries. Retrieved 11 March 2019. ^ Michael P. Masser; David B. Rouse (1997). "Australian Red Claw Crayfish" (PDF). SRAC Publication (244). Archived from the original (PDF) on 13 May 2005. ^ "Kōura". NIWA. 26 May 2009. Retrieved 18 September 2012. ^ Alycia L. Rode & Loren E. Babcock (2003). "Phylogeny of fossil and extant freshwater crayfish and some closely related nephropid lobsters". Journal of Crustacean Biology. 23 (2): 418–435. doi:10.1651/0278-0372(2003)023[0418:POFAEF]2.0.CO;2. JSTOR 1549646. ^ Emory University (12 February 2008). "Oldest Australian crayfish fossils provide missing evolutionary link". ScienceDaily. ^ a b James R. Lee (5 December 1998). "TED Case Studies Crayfish Plague #478 European Crayfish Dispute". Archived from the original on 10 January 2009. Retrieved 20 January 2008. ^ "Kosher defined". Triangle K. Retrieved 1 December 2010. ^ Meyer-Rochow, Victor Benno (2009). "Food taboos: their origins and purposes". Journal of Ethnobiology and Ethnomedicine. 5–18:: 18. doi:10.1186/1746-4269-5-18. PMC 2711054. PMID 19563636. ^ Robert P. Romaire, W. Ray McClain, Mark G. Shirley and C. Greg Lutz, Crawfish Aquaculture — Marketing (SRAC Publication No. 2402). October 2005. Southern Regional Aquaculture Center. ^ Larry W. de la Bretonne Jr. & Robert P. Romaire (1990). "Crawfish production: harvesting, marketing and economics" (PDF). SRAC Publication (242). Archived from the original (PDF) on 12 December 2010. ^ "1978–2007: Louisiana Summary of Agriculture and Natural Resources" (PDF). Louisiana State University Agricultural Center, Baton Rouge, Louisiana. 2009. Archived from the original (PDF) on 2 April 2012. ^ "Differences Between Red Swamp Crawfish and White River Crawfish". The Louisiana State University Agricultural Center. ^ Web, Animal Diversity (16 September 2002). "Kids' Inquiry of Diverse Species, Orconectes propinquus, northern clearwater crayfish: INFORMATION". BioKIDS. Retrieved 27 July 2018. ^ "Citer". Wikimedia Toolforge. 1 January 2017. Retrieved 27 July 2018. ^ "Striped Bass Feeding Facts and Information". Bass Fishing Gurus. 4 March 2015. Retrieved 27 July 2018. ^ "The Key to Locating Bass, Walleye or Pike". Funny Fishing Tshirts & Fishing Gifts – Fish Face. 25 August 2017. Retrieved 27 July 2018. ^ "Tips on How to Catch Muskie". Fishing Tips Depot. 27 July 2018. Retrieved 27 July 2018. ^ Bean, Richard Alden (6 April 2011). "Crayfish: What Better Spring Bait For Bass?". Game & Fish. Retrieved 27 July 2018. ^ "Fox and Des Plaines Rivers Watershed" (PDF). Critical Trends in Illinois Ecosystems. Illinois Department of Natural Resources. 2001. ^ Tennessee Aquatic Nuisance Species Task Force (2007). Tennessee Aquatic Nuisance Species Management Plan (PDF). Tennessee Wildlife Resources Agency. ^ "Hawaii Risk Analyses and Management for Dreissenid Mussels" (PDF). US Fish & Wildlife. 2012. p. 3. Retrieved 27 July 2018. ^ "zebra mussel (Dreissena polymorpha) – Species Profile". Nonindigenous Aquatic Species. 16 November 2005. Retrieved 27 July 2018. ^ J. Thompson; F. Parchaso; A. Alpine; J. Cloern; B. Cole; O. Mace; J. Edmunds; J. Baylosis; S. Luoma; F. Nichols (13 December 2007). "The History and Effects of Exotic Species in San Francisco Bay". United States Geological Survey. ^ a b abebault (May 2013). "Crayfish Facts". Google. Retrieved 27 July 2018. ^ "YouTube". YouTube. 12 April 2018. Retrieved 27 July 2018. ^ Gerald Pottern. "Mexican dwarf orange crayfish, Cambarellus patzcuarensis". Retrieved 13 October 2010. Thomas Henry Huxley (1880). The Crayfish: an Introduction to the Study of Zoology. New York: D. Appleton & Co.
Christoph Goessmann; Charlotte Hemelrijk; Robert Huber (2000). "The formation and maintenance of crayfish hierarchies: behavioral and self-structuring properties" (PDF). Behavioral Ecology and Sociobiology. 48 (6): 418–428. doi:10.1007/s002650000222. Sterling K. Johnson; Nathan K. Johnson (2008). Texas Crawdads. College Station, Texas: Crawdad Club Designs. ISBN 978-0-9801103-0-2. Jerry G. Walls (2009). Crawfishes of Louisiana. Baton Rouge, LA: Florida State University Press. ISBN 978-0-8071-3409-2. Wikimedia Commons has media related to Crayfish.